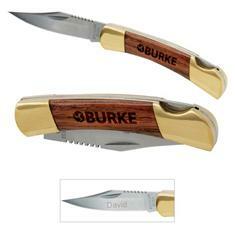 Welcome new Employees or Customers with this small Rosewood Pocket Knife. Your logo is engraved into the wood to make an impression that lasts. This is a budget friendly item that makes a nice Thank you gift! Imprint Area: 1-7/16" x 1/4"